One of the distinguishing features of the Space Frontier application is its excellent design. The design is noticeable right at the entrance to the game page in GooglePlay. The graphics are simple enough, but at once there is an individuality and sense of taste in the artist. In addition, even before the game is downloaded to the device, you can already judge it by looking at the rating, the average rating of which is 4.2, which may indicate the relevance of the game, but more will be the presence of more than 5 million downloads. Meanwhile, the game was established, it took no more than 3 minutes together with the upload of the project files. The device is not the strongest, so the application is perfectly optimized. The first download also passed quickly. An unpleasant surprise was the advertisement that appeared immediately after the application was downloaded. On the first game screen is a description of the game process, which consists of two points. For people who do not speak English, it may not be all clear, but try to play and see the opposite. And so the first launch and the lower stage of the rocket was not disconnected in time. The rocket exploded and, under the sad music, I was offered to look at the landscape of the cosmodrome from which the launch was made, as well as a record that I will certainly beat, as it is already quite understanding how to manage the undocking of parts. The second launch of the missile was successful, the screen is “tapping” at the moment when the conventional fuel in the lower stack of the missile is consumed. The best result will be if you undock at the last minute. The closer the tap to the last second, the more the rocket will have fuel, and consequently higher it will soar. An achievement was discovered in which it is necessary to bring the satellite into orbit. 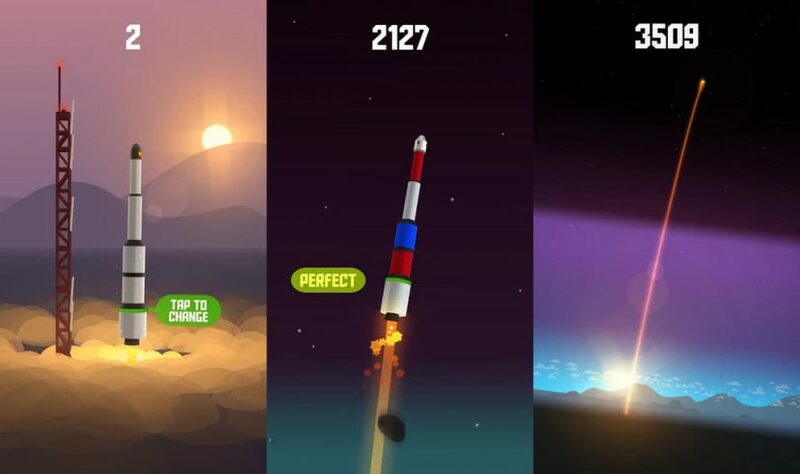 In total, there are 10 achievements in the game, you can get them simply by playing the game, for example, after 1000 successful rocket launches, the satellites will be put into orbit. The reward for the task is quite generous and ranges from 1,000 to 10,000 XP. For rocket launches, game coins are credited inside which can be used to improve the missile. Also after the round, you can view advertising – just for coins. Between the flights, there is a wheel of fortune, which can be scrolled after 4 hours or after watching 30 seconds of advertising. The game is very addictive, there is a desire to soar higher, the pumping system shows that the game must have a logical conclusion, but you can learn this only after passing through all levels, but this is already a topic of another review on the passage. Space you flights and good mood. Step 4. Now type Space Frontier inthe search bar. After the search, click “Install” to continue and finish.